For other uses, see Sheikh (disambiguation). Sheikh (/ʃeɪk/ SHAYK, /ʃiːk/ SHEEK; Arabic: شيخ‎ šayḫ [ʃajx], mostly pronounced [ʃeːx], plural شيوخ šuyūḫ [ʃuju:x])—also transliterated Sheik, Shykh, Shayk, Shaykh, Cheikh, Shekh, and Shaikh—is an honorific title in the Arabic language. It commonly designates the ruler of a tribe, who inherited the title from his father. "Sheikh" is given to a royal male at birth and the related title "Sheikha" is given to a royal female at birth. The word in Arabic stems from a triliteral root connected with age and aging: ش-ي-خ, shīn-yā'-khā'. The title carries the meaning leader, elder, or noble, especially in the Arabian Peninsula within the Tribes of Arabia, where shaikh became a traditional title of a Bedouin tribal leader in recent centuries. Due to the cultural impact of Arab civilization, and especially through the spread of Islam, the word has gained currency as a religious term or general honorific in many other parts of the world as well, notably in Muslim cultures in Africa and Asia. In Sufism, the word Sheikh is used to represent a wali who initiates a particular tariqa which leads to Muhammad, although many saints have this title added before their names out of respect from their followers. One prominent example is Shaikh Abdul Qadir Jilani, who initiated the Qadiriyya order which relies strongly upon adherence to the fundamentals of Islam. In the Arabian Peninsula, the title is used for royalty, such as kings, princes, and princesses. For example, it was the term used in the West to refer to the leaders of Kuwait's ruling Al-Sabah dynasty, and in UAE Al-Nahyan dynasty and Al Maktoum dynasty. The same applies to all the Gulf countries. The term is used by almost every male and female (Sheikha) member of all the Gulf royal houses. In Mount Lebanon, the title had the same princely and royal connotation as in the Arabian peninsula until the Ottoman invasion in 1516 since it represented an indigenous autonomous "sui iuris" ruler or tribal chief. An example of an ancient families that holds the title of "sui iuris" sheikh is the Al-Chemor family ruling since 1211 CE in Koura and Zgharta until 1747 CE,, the Boudib Family (descendants of The Hashemite Family) who were Ehdenian rulers of Jebbeh since 1471CE until 1759CE. Descendants of this royal family now live in Miziara, Mexico and Nigeria  , and the Abu Harmoush family which ruled the Chouf region until the Battle of Ain Dara in 1711 CE. After the Ottoman rule and the implementation of the Iltizam system, the title gained a noble instead of royal connotation since it was bestowed by a higher authority, in this case the Ottoman appointed Emir who was nothing more than a mültezim or tax collector for the empire. Some very influential Maronite families -who had the title bestowed upon them in chronological order- are El Hachem of Akoura (descendants of The Hashemite Family, since 1523), El-Khazen (since 1545), Hubaysh of Kisrawan, and Douaihy of Zgharta. Other families who are nowadays addressed or known as "Sheikhs" were not traditionally rulers of provinces, but instead they were high-ranking officials at the service of the Emir at that time. In the Maghreb, during the Almohad dynasty, the caliph was also counseled by a body of shaykhs. They represented all the different tribes under their rules, including Arabs, (Bedouins), Andalusians and Berbers and were also responsible for mobilizing their kinsmen in the event of war. In the Muslim parts of the Horn of Africa, Sheikh is often used as a noble title. In Somali society, it is reserved as an honorific for senior Muslim leaders and clerics (wadaad), and is often abbreviated to "Sh". Famous local Sheikhs include Abdirahman bin Isma'il al-Jabarti, an early Muslim leader in northern Somalia; Abadir Umar Ar-Rida, the patron saint of Harar; Abd al-Rahman al-Jabarti, Sheikh of the riwaq in Cairo who recorded the Napoleonic invasion of Egypt; Abd Al-Rahman bin Ahmad al-Zayla'i, scholar who played a crucial role in the spread of the Qadiriyyah movement in Somalia and East Africa; Shaykh Sufi, 19th century scholar, poet, reformist and astrologist; Abdallah al-Qutbi, polemicist, theologian and philosopher best known for his five-part Al-Majmu'at al-mubaraka ("The Blessed Collection"); and Muhammad Al-Sumaalee, teacher in the Masjid al-Haram in Mecca who influenced many of the prominent Islamic scholars of today. Senegalese Sheikh Tidiane Gaye giving an Islamic lecture in Louga. In West Africa, sheikh is a common title for those of Royal Bloodlines and Muslim scholars and leaders. Among Islamic communities in Senegal, Guinea (mostly in the town of Timbo), Niger and Gambia, among other areas, the title is usually spelled as Cheikh. One of the most notable Royal families of West Africa belongs to Abdul-Rahman ibn Ibrahim Sori, who was a Torodbe Fulani Muslim ruler (Emir) born in 1762 in the city of Timbo, now located in Guinea. His father, Almami Ibrahim Sori consolidated the Islamic confederation of Futa Jallon in 1776, with Timbo as its capital, where Abdul Rahman lived and studied. He was learned in the Islamic sciences and could speak at least 4 different African languages, in addition to Arabic. Abdul-Rahman ibn Ibrahim Sori Was sold into slavery and became an American citizen in Natchez, Mississippi. His title of Emir was reinstated upon his freedom by United States John Quincy Adams upon his return to Africa, Liberia. Emir Abdul-Rahman ibn Ibrahim Sori's descendants, Sheik Dr. Artemus Gaye of Monrovia, Liberia and Sheika Karen Chatman of Natchez, Mississippi, maintain their official Royal titles. 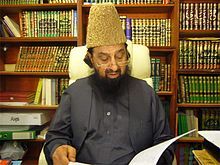 Pakistani Sheikh Syed Abdul Qadir Jilani, a prominent Sunni scholar. In South Asia it is not an ethnic title but an occupational title generally attributed to Muslim trading families with rarely any Arab lineage. After the advent of Islam in South Asia, (Brahmins, Rajputs, Khatris, Kayasthas and Shudras) tribes also converted to Islam and adopted the title. In Punjab, Pakistan the Hindu Brahmins, Kshatriya, Rathores, Bhattis, Chauhans, Rangrez and other Rajput converted by different Ismaili Pirs to Islam. Ismaili Pirs gave the new converts of Punjab the hereditary title of Shaikh as well as the Muslims who immigrated from Arabia and settled in Punjab adopted this title. Distinguished Sindhi Shaikhs include Imtiaz Shaikh, MPA Shikarpur and Special Advisor to PM and Former Provincial Minister and Bureaucrat, Sindh; Shaikh Ayaz, Sindhi poet of Pakistan; Najmudddin Shaikh, Former Foreign Secretary, Pakistan; Ghulam Shabir Shaikh, Former IGP Sindh, Pakistan; Dr. Abdul Hafeez Shaikh, Federal Finance Minister, Pakistan; Muhammad Ayub Shaikh, Chairman Employees' Old Age Benefits Institution], Pakistan; Maqbool Shaikh, Former Provincial Minister for Food and Health, Sindh; Faraz Shaikh, Chairman Sindh Naujawan Shaikh Ittehad, Sindh; Faryaz Nisar Shaikh, Vice Chairman Sindh Naujawan Shaikh Ittehad, Sindh; Imam Bux Shaikh, Former General Secretary Peoples Students Federation Karachi, Former General Secretary Peoples Engineers Forum Sindh, Famous Student Leader of Pakistan. In Indonesia and other parts of Southeast Asia, Sheikhs are respected by local Muslims. Higher knowledgeable people in Indonesia are usually referred to as "Ustad" or "Kyiayi". From the perspective of Iran (which includes Islamic view, too), the word or title of Sheikh possesses diverse meanings, among the individuals who are aged, wise, scientist; and totally it has been a honorable title who was/is used for the elders/learned (scholars), such as: Sheikh al-Rayees Abu Ali Sina, Sheikh Mufid, Sheikh Morteza Ansari, etc. The ones (Islamic scholars) who are from the Islamic prophet Muhammad's offspring/descendants, are called Sayyid/Seyyed instead of Sheikh, such as Seyyed Ali Khamenei and Seyyed Ali Sistani. Historically, female scholars in Islam were referred to as shaykhah (Arabic: شيخة‎) (alt. shaykhat). Notable shaykha include the 10th-century Shaykhah Fakhr-un-Nisa Shuhdah and 18th-century scholar Al-Shaykha Fatima al-Fudayliyya. A daughter or wife or mother of a sheikh is also called a shaykhah. Currently, the term shaykhah is commonly used for women of ruling families, in the Arab states of the Persian Gulf with the exception of Oman. ^ Abun-Nasr, Jamil M. (2007). Muslim Communities of Grace: The Sufi Brotherhoods in Islamic Religious Life. Columbia University Press. p. 94. ISBN 978-0-231-14330-1. ^ "Tārīkh al-ṭāʼifah al-Mārūnīyah (Microform, 1890)". [WorldCat.org]. ^ El - Doaihi. A glimpse into the History of Ehden The Most Legendary Ehdenian Battles (2000BC - 1976). ^ Niane, Djibril Tamsir; Africa, Unesco International Scientific Committee for the Drafting of a General History of (1 January 1984). "Africa from the Twelfth to the Sixteenth Century". UNESCO. Retrieved 19 February 2017 – via Google Books. ^ "Scholars Biographies - 15th Century - Shaykh Muhammad ibn 'Abdullaah as-Sumaalee". Fatwa-Online. Archived from the original on 15 September 2012. Retrieved 26 August 2012. ^ "Shaykhah Shuhdah, Fakhr-un-Nisa". Haq Islam. Retrieved 9 February 2015. ^ Siddiqi, Muhammad Zubayr (1993). "Hadith Literature Its origin, development and special features: Women Scholars of Hadith". The Islamic Texts Society Cambridge: 117–123. Retrieved 23 February 2015.